Use the SKLZ Hurricane Category 4 baseball and softball training unit to perfect your swing. This tool allows you to improve your power while focusing on consistent contact and generating bat speed. With four (4) elastic resistance bands, you can increase and decrease your tension as needed. The Hurricane teaches you to drive through the ball, instead of stopping short. Use this for solo tee practice or as a dynamic moving target. Work the SKLZ Hurricane Category 4 batting trainer with your teammates or gain an edge as you train independently. This advanced solo trainer’s power-generating snap-back action and multi-twist design provides immediate feedback on your swing. Training doesn’t have to be limited to practice or on the field. 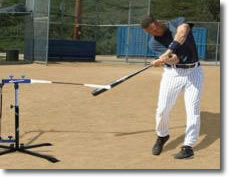 With easy set up and break down, you can use the Hurricane at home, at the park, or as a hitting station during drills. The heavy-duty hitting machine is made of steel, but is lightweight enough to travel. The 4-foot base is non-slip and easy to set up; no tools necessary. The gear includes ground stakes to keep it rock solid, even with a slugger taking swings. Hit like the pros with the Derek Jeter Hurricane--perfect for solo batting training. ADJUSTABLE TRAINING TOOL. Adjust resistance and pitch height with the SKLZ Hurricane Category 4. The height adjusts from 29"-43", imitating high and low pitches. Meanwhile, the power bands allow adjust your speed from 1-4, making it ideal for any ball player.